Francorchamps, Belgium (July 28, 2012) — Racing competitively in the rain at Spa-Francorchamps is an art form, and once again, American Michael Lewis showed his skill by another outstanding performance during a challenging situation. For Round 12 of the FIA European Formula 3 Championship today at Spa-Francorchamps, rain had been falling for most of the morning, which is typical of the Belgium track located in the Ardennes. 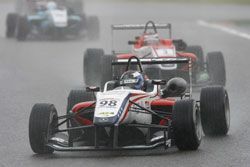 When the 29 Formula 3 cars lined up on the starting grid, the rain became intermittent, but Michael looked forward to racing at the 6.968-kilometer Grand Prix circuit, which was home to his first win in the Formula 3 Italia series last season. Based on Friday’s qualifying session, Michael’s PREMA Powerteam Dallara F312 powered by Mercedes, featuring K&N and Eibach Springs sponsorship, was slotted on the starting grid in 11th position. Michael, along with 28 other Formula 3 drivers, anticipated the beginning of the race, so when the starting lights went out they charged toward the first turn of the track, the La Source hairpin. Michael made another strong start, which has been common of late, and by the end of the first lap, he had already passed three cars and moved into 8th position. Then on lap 2 he made a pass for 7th, which he held for two laps. Michael advanced and took another position on lap 4, and then settled in line for the next 9 laps. A yellow flag came out on the track on lap 11 for Michael’s PREMA Powerteam teammate Sven Muller, which grouped the field together for the three remaining laps. When the green flag appeared, Michael set his sights on Jack Harvey and on lap 13 passed him to claim the 5th spot with one lap to go. Michael crossed the finish line in pouring rain in 5th. “It was a great race and great fun,” exclaimed Michael. 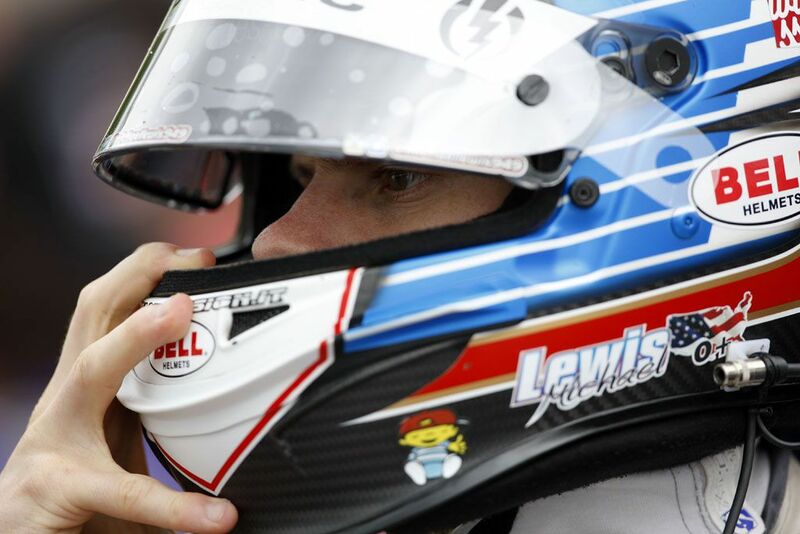 “My car was really good and I was able to gain a few positions. The La Source corner suited me particularly well especially the overtaking maneuver of Jack Harvey was great. Later on, I could have overtaken Jazeman Jaafar, but the move was risky and I didn’t want to put my 5th place in jeopardy. As with Friday’s Round 11, Michael earned another podium in the FIA European Formula 3 Championship because he was the 2nd highest finisher registered to earn points in the Championship. As a result of the two podiums this weekend at Spa-Francorchamps, Michael now stands 6th in the Championship points’ standings, only a mere point behind 5th position. 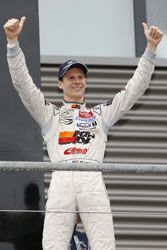 Michael will next compete in the Formula 3 Euro Series as it heads to Nurburgring in Germany, August 17–19, 2012, which will also award points toward the FIA European Formula 3 Championship. Michael Lewis’s 2012 sponsor lineup includes Eibach Springs, K&N Engineering, GoPro, Electric Sunglasses, Klotz Synthetic Lubricants, Cometic Gasket, Bell Helmets, Braille Battery, Wiissa, CMNTY Clothing and Performance Racing Industry. This entry was posted in News on July 28, 2012 .